Just like high-end restaurants that are hidden to all but those who have been let in on the secret, you won’t see any flashy signs hanging over the door. 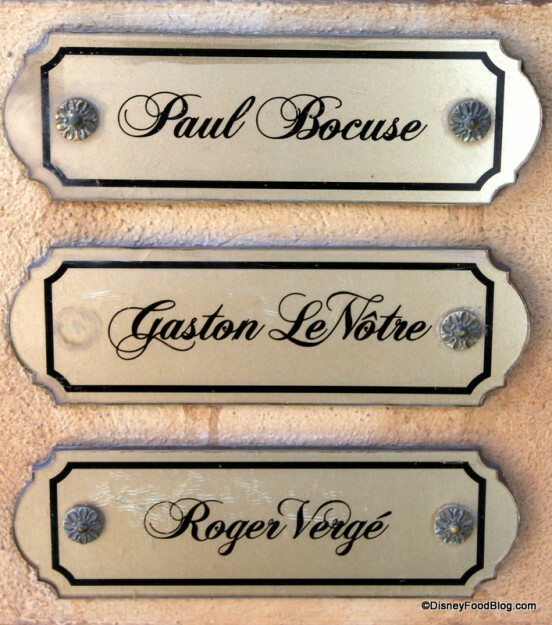 Instead, you’ll simply catch a glimpse (if you’re really looking for it) of the name plaques that commemorate the three original founding chefs of Les Chefs de France: Paul Bocuse, the late Gaston LeNôtre, and Roger Vergé. While the three legendary chefs originally oversaw the food outlets here, these days they are run by Jerome Bocuse, Chef Bocuse’s son. Enter the door and you’ll find a rather unassuming room crowned with a winding staircase. 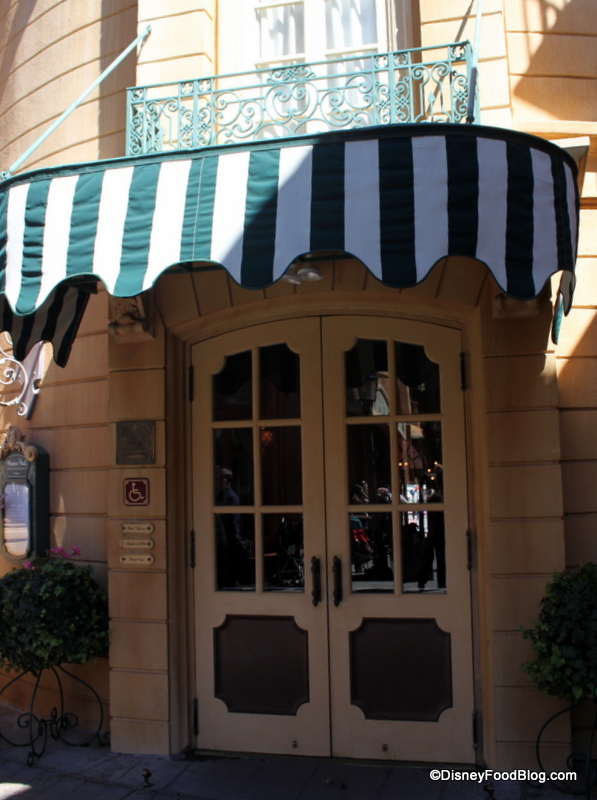 Through the doorway opposite, you’ll see the hustle and bustle of Les Chefs de France Restaurant. If you have had the pleasure of dining here before, you will notice subtle differences in the decor beginning in the lobby area. 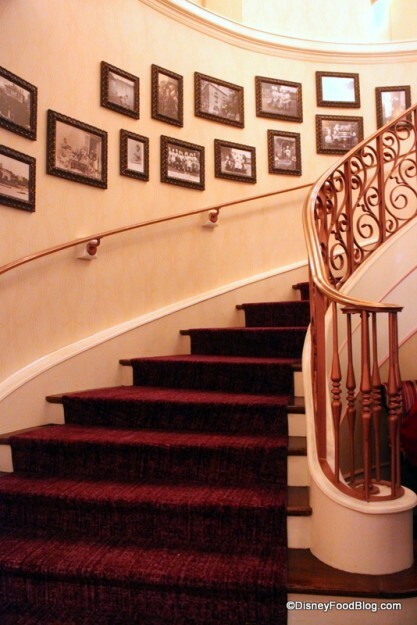 While the deep Burgundy color scheme remains the same, gone are the ornately patterned carpet and wallpaper. There are two ways to access Monsieur Paul’s second floor dining room. The first is this delightful elevator, hidden behind an oversized door. 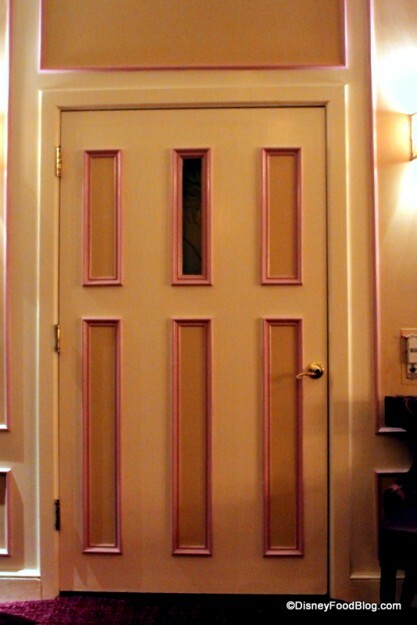 Very reminiscent of the wonderful quirkiness that you find in Parisian buildings, n’est pas? Your other option is the beautiful, sweeping staircase. 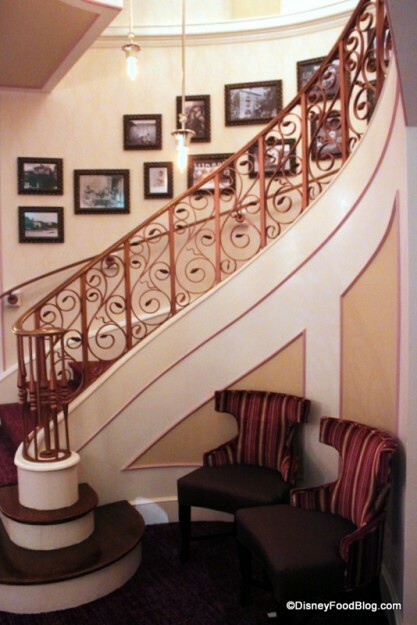 I was very relieved to see that the gorgeous art nouveau railing made the refurb cut. Pause a moment as you begin ascending to take in the scene, and be sure to check out the fascinating picture gallery. There are many photos of the chef’s long and storied career. 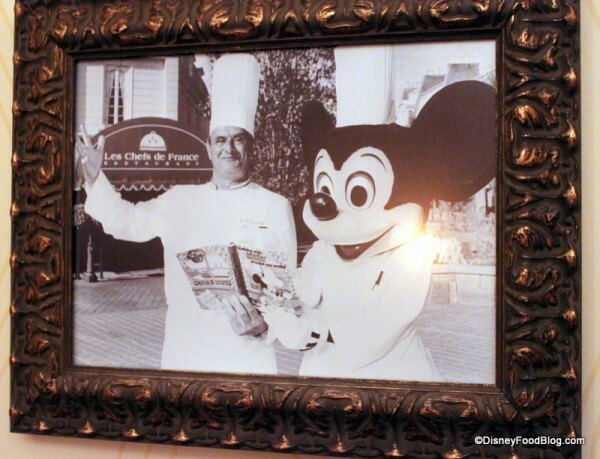 As you register the details, you’ll discover the rich history of Paul Bocuse himself, and how it has intertwined with this particular bit of Disney throughout the years. One of my favorite shots is of Chef Bocuse and Mickey in front of Les Chefs de France, taken for the restaurant’s opening. 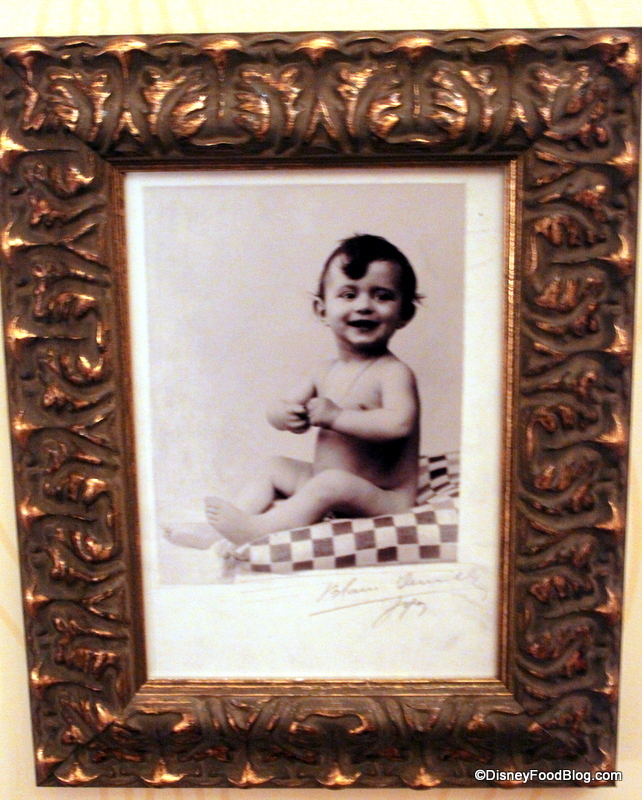 The photographs and mementos continue to document accolades, and there are also pictures from the family archives. 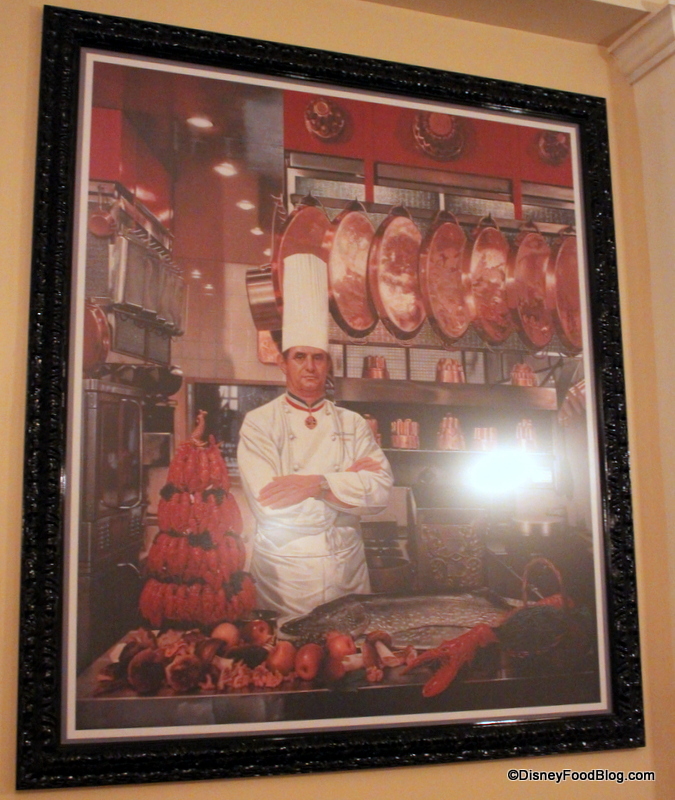 Once you reach the dining room, the photos and mementos from Chef Bocuse’s career continue. This offers a more whimsical feel to the dining room than was previously seen. 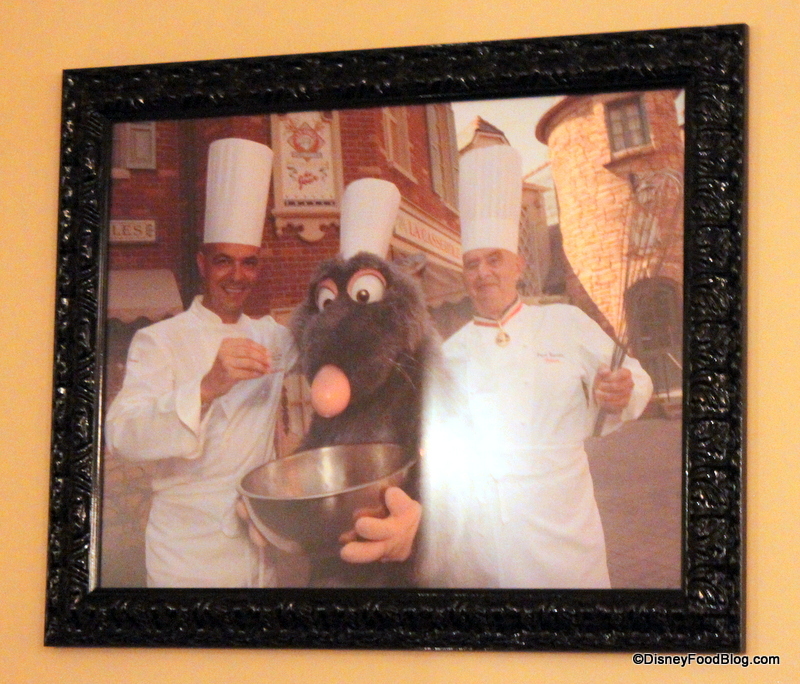 This shot of the famed chef with Remy from Ratatouille is one of my favorites. And this portrait is placed so that all can see it while walking back out to the stairway. 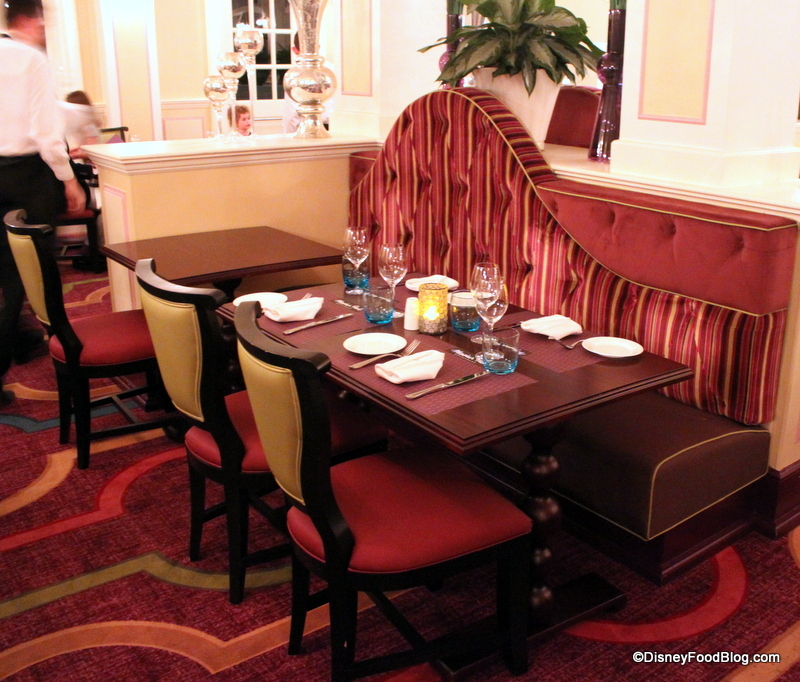 As you continue to look around the refurbished dining room, the overall feel is similar to Bistro de Paris; but there are subtle differences. You see lovely decorative touches with a lighter, more modern flair. It may not be so noticeable unless you compare it with photos from the old space. Check out our earlier review to see how things have changed. I couldn’t stop looking at this “bubble” chandelier! Banquettes and carpets have a decidedly modern feel. Glassware has been updated as well. The bubble motif is carried through to the tables, as these cute candles replace the more traditional shaded candlesticks. Also gone are the ultra formal white tablecloths. They’ve been replaced with paper placemats like you might find in a less formal Parisian bistro. But cloth napkins, folded into the trademark “chef jacket” design, remain! 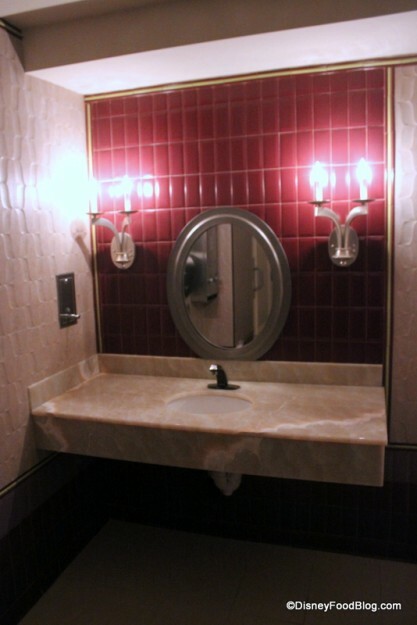 With these shots, you can really see the subtle decor changes. The space no longer feels like you’ve timewarped from the 1950s. Flowing curtains and brass touches have given way to bare windows and white trim. Soft pastels in updated colors break up the space. A few round tables also add interest. Dark wood and newly upholstered chairs complete the transformation. Restroom Vanity -- Or Should We Say W.C.? And now that you’ve seen the space, it’s time to turn our attention to the food. Brush up on your French, and let’s go! 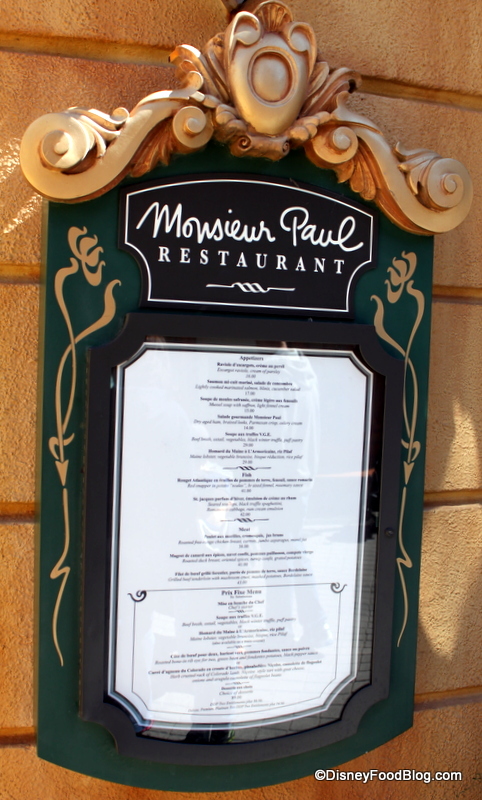 We received our first glimpse of the Monsieur Paul menu outside (don’t worry — we have close ups for you to read, too, so don’t strain your eyes). I like having the option of seeing what’s available before I commit to a meal! 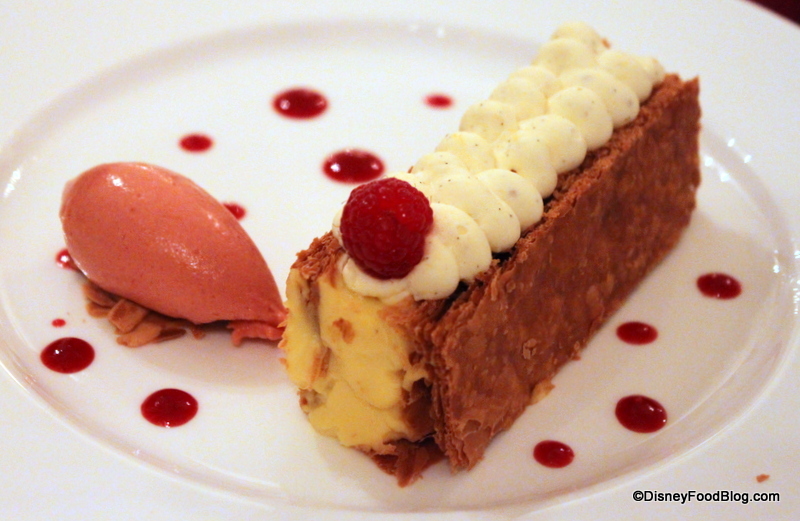 The emphasis on the menu here are classic Bocuse dishes, created with American ingredients. 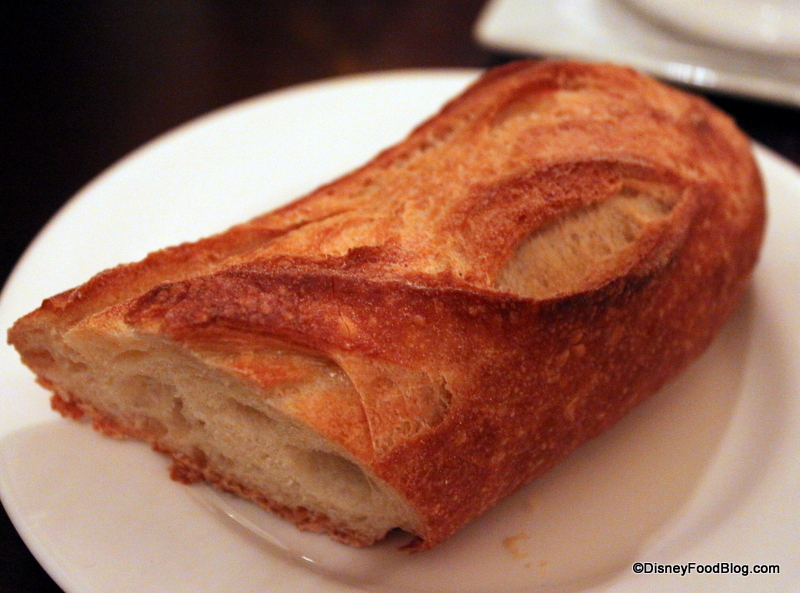 It’s an interesting twist on French-American fusion, but the vibe is definitely classic French. 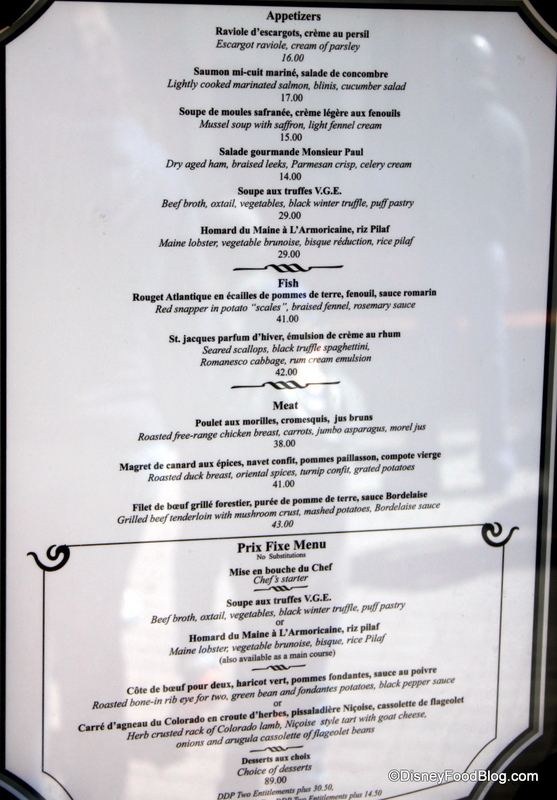 The menu items continue to be in French, with the English translation just below each item, lending an air of authenticity. It may be of interest to note that there are no vegetarian options on the menu; however, special dietary needs can be accommodated. 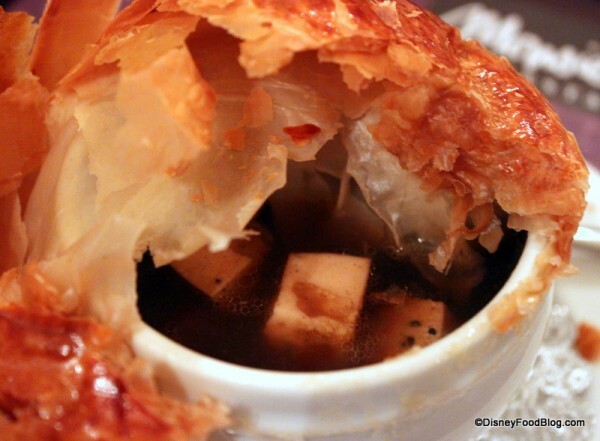 We’ve got a great guest review where DFB readers had an incredible off-menu vegetarian meal at Monsieur Paul’s a couple of months ago! 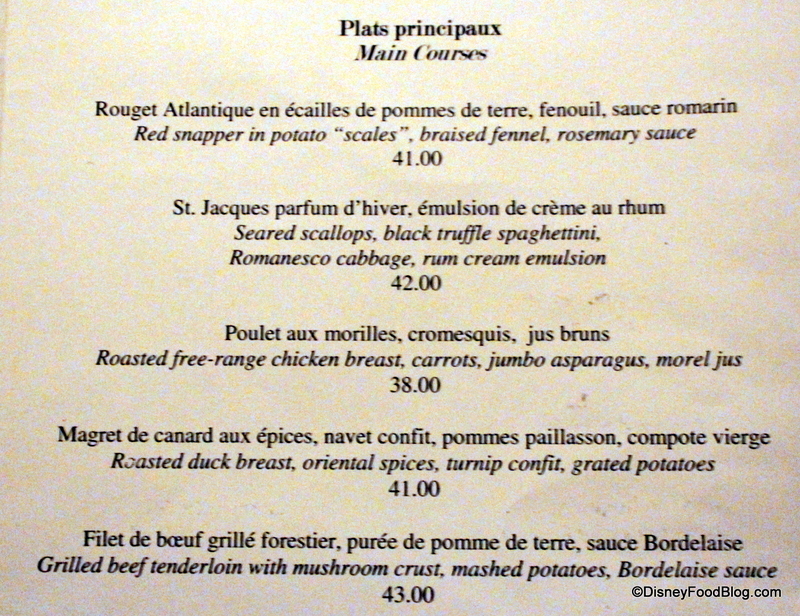 Guests may choose from the a la carte menu above, or can indulge instead in the prix fixe menu, pictured below. Please note, however, that if you’re using any of the Disney Dining Plans, there may be surcharges. 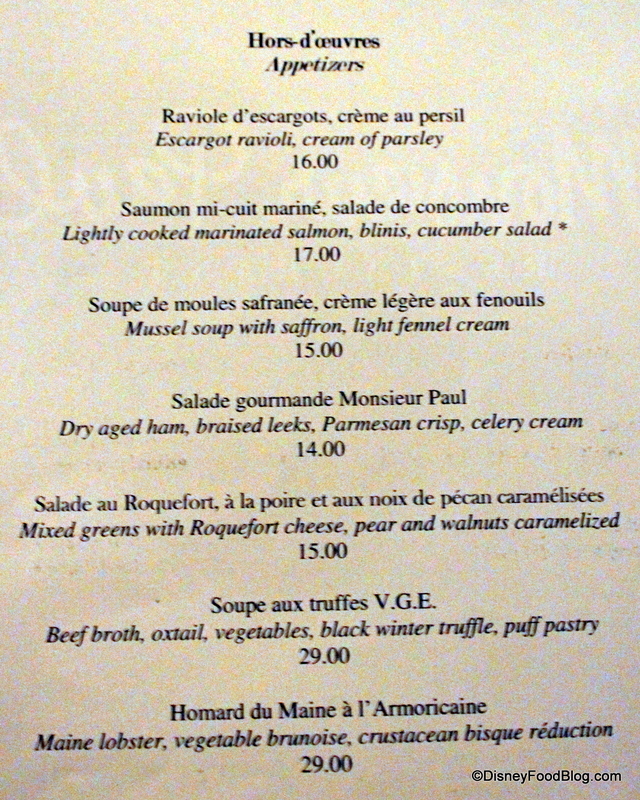 Read the details in our previous post about Monsieur Paul’s menu. After we placed our orders, our server brought the first taste of our meal to the table — an amuse bouche of tiny Gougères, or little puffed cheese biscuits. 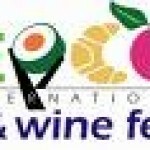 We’d heard stories about amuse being the same type of escargot served at the Epcot Food and Wine Festival, so these were a bit disappointing. I love bread and cheese, but these seemed slightly underdone. Next came bread service, which consisted of a portion of a classic French Baguette (not completely fresh, but not too bad) and a small pot of softened, unsalted Butter. We were soon onto our appetizers. 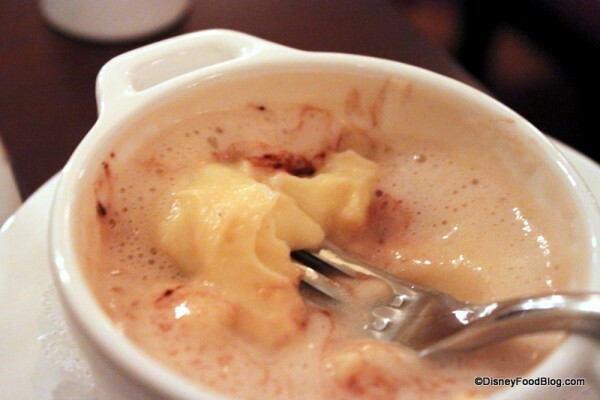 I couldn’t resist trying the Soupe aux Truffes V.G.E. This dish, more than any other on the menu, has a story. 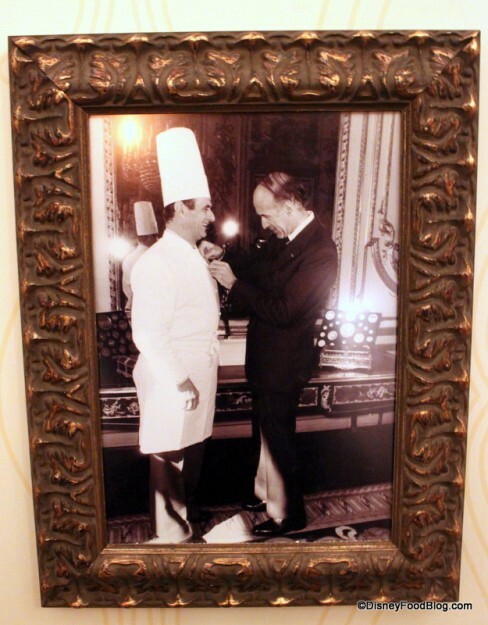 The first version of it was created by Chef Bocuse for then-President Valéry Giscard d’Estaing, who held office in France from 1974 until 1981. At $29 per serving, you had better love truffles to get this! Under the puff pastry top, it included ginormous slices of super-expensive fungi, along with oxtail and vegetables. I’m obviously not a trained culinary expert, so I’m guessing the “foodies” among us might appreciate this more than I did. To me, it tasted like a beef broth (a good beef broth) with chunks of spongy meat (the oxtail). The pieces of truffle were massive slices, but the flavor didn’t really come through in my opinion. 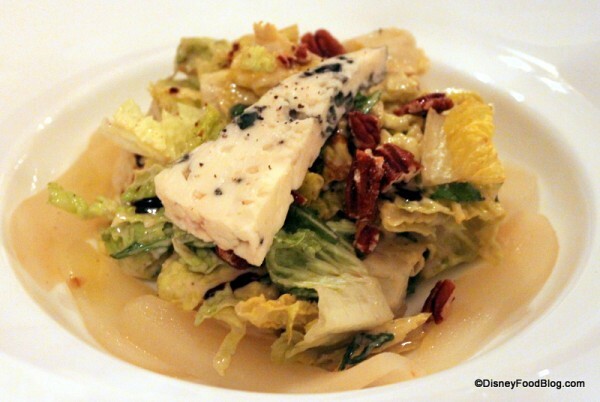 We also ordered the Salade au Roquefort. In addition to the beautiful and very large piece of Roquefort cheese that topped the greens, there were also poached, sliced pears. There was a substitution of pecans for the caramelized walnuts that the menu mentioned, but the salad was still good. Two dishes were delivered by mistake to our table, so I took the opportunity to snap photos of them for you! We didn’t taste them, however. But in case you’d like to know what the Salade Gourmande Monsieur Paul or the Soupe de Moules Safranée look like, here you go! Our entrees arrived shortly after we finished with our starters. 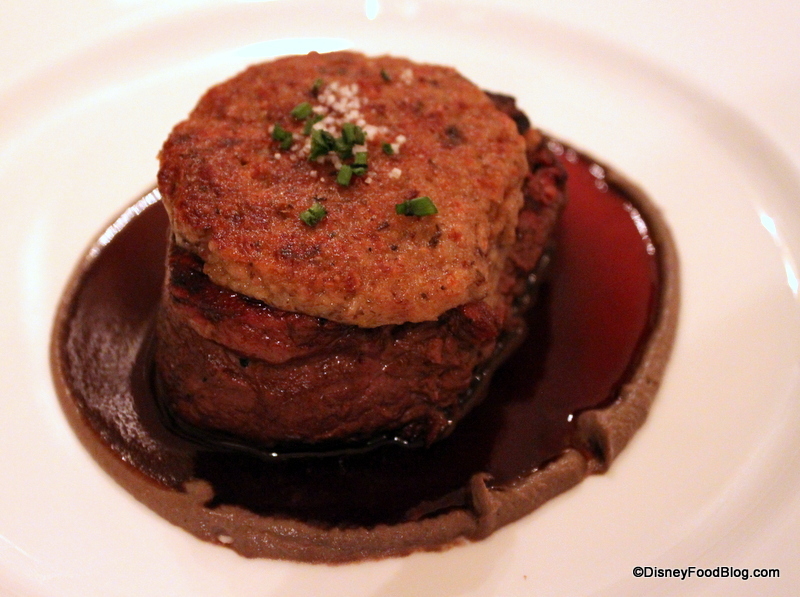 I had heard good things about the Filet de Boeuf, so I decided to give it a try. My beef tenderloin was perfectly cooked, and was served with an ample quantity of Bordelaise, a brown wine sauce that was delicious. I was a little confused upon arrival by what was on top of the steak, and I had to reference the menu to see what it was. A mushroom crust! This had a strange texture — like pate — and didn’t add a lot to the flavor or “mouth feel” of the dish for me. But the steak itself was very good. “Cappuccino” referred to the way they were served. No worries — there was no coffee involved here! A layer of thick foam covered the fluffy, whipped potatoes. I couldn’t really distinguish the flavors at play, and I’m not really a big fan of foam. So while I appreciate the inventive approach, I would have preferred my spuds in a less fancy manner. My friend ordered the Rouget Atlantique, or Red Snapper. This entree definitely took the prize for most beautiful presentation! The “scales” on the fish are actually created from potatoes, and so it reminded me a bit of the Flying Fish’s Potato-Wrapped Red Snapper. 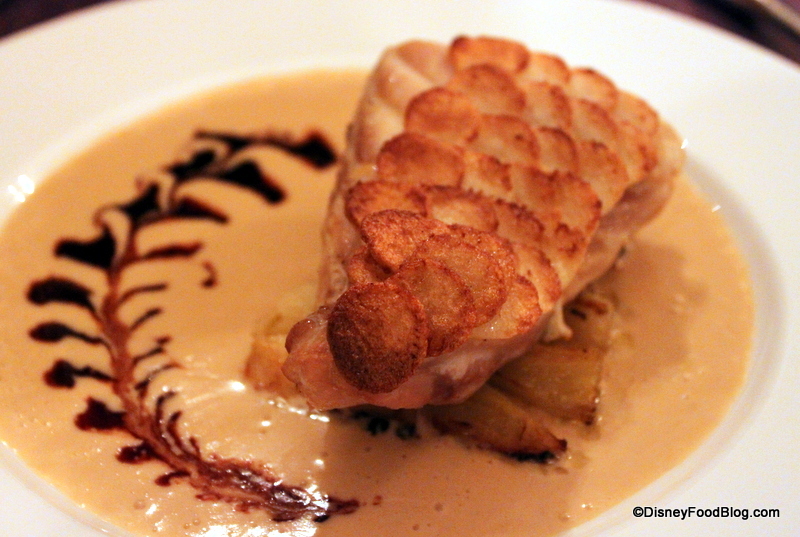 Served on a bed of braised fennel, the flavors of the creamy sauce worked well with the delicate fish and vegetable. The rosemary sauce here was the clear winner of the night. It was amazing!! We both just wanted a bowl of it after we tried it. As dinner drew to a close, we began to anticipate desserts — because no way am I eating in a French restaurant and not having a sweet! There were some lovely, if predictable, choices. Because we could not decide, we opted for three choices. Ah — anything for you guys! 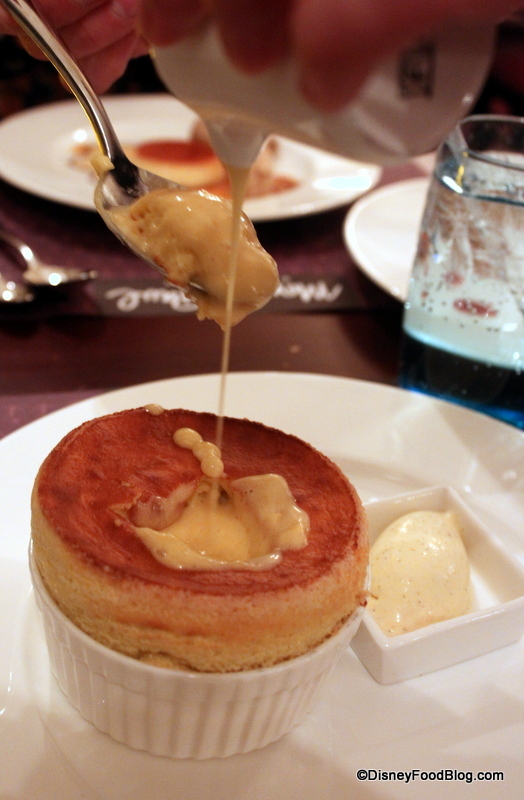 To begin, we tried the Soufflé Chaud à l’Orange, a warm orange souffle served with a Grand Marnier Sauce. 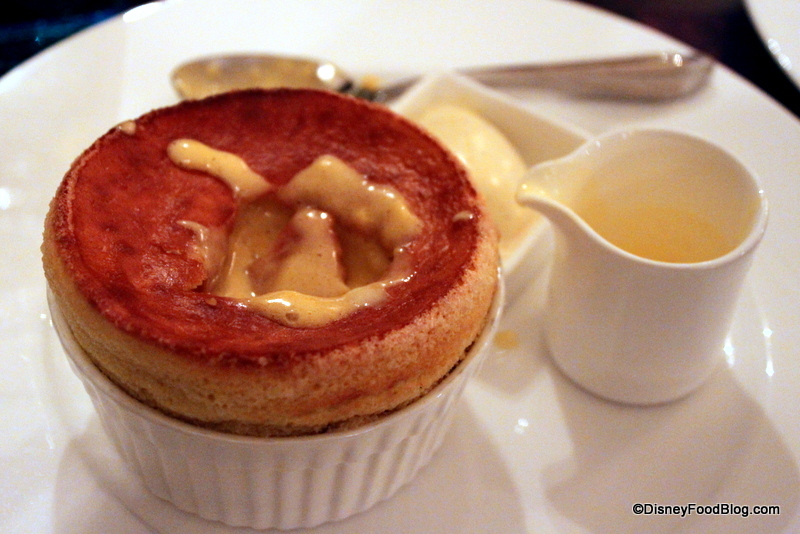 A classic French choice, the souffle was sweet and moist, and the creamy sauce had just a hint of tart orange flavor. 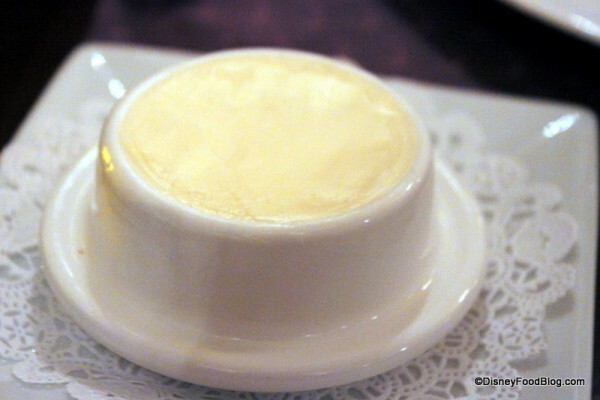 It was also served with a quenelle of vanilla ice cream, which was a nice extra. Next, we sampled the Millefeuilles aux Fruits Rouge, or Napoleon with Berries. 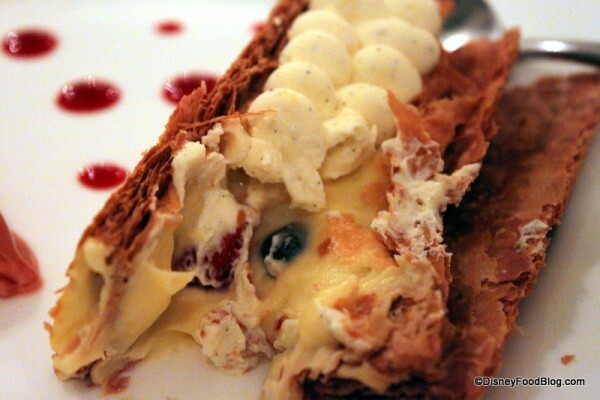 It was constructed rather “sideways” from a traditional Napoleon but was attractive. You guys know how much I love lemon and berries, so this was a nice, refreshing dessert. A quenelle (they do love their oval ice cream scoops here) of strawberry sorbet completed the dish, which also received high marks. 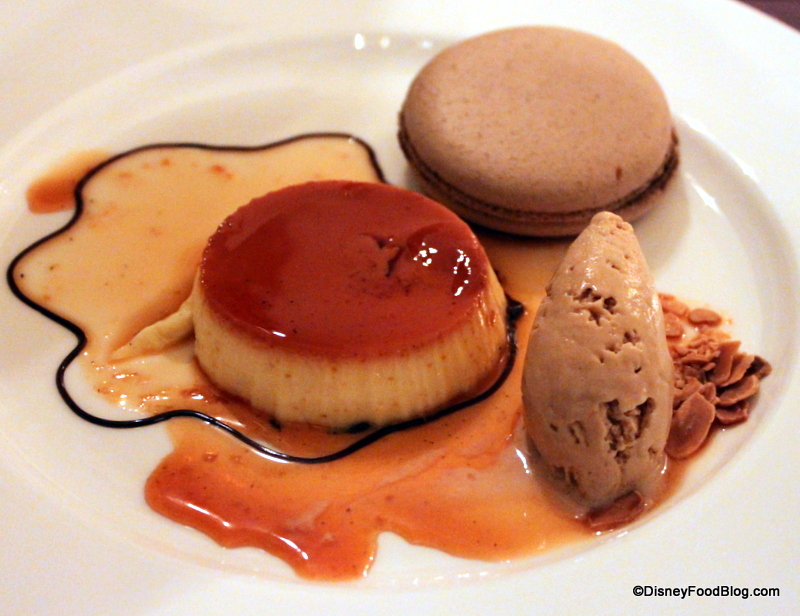 Finally, it was time to dig into the Crème Caramel. 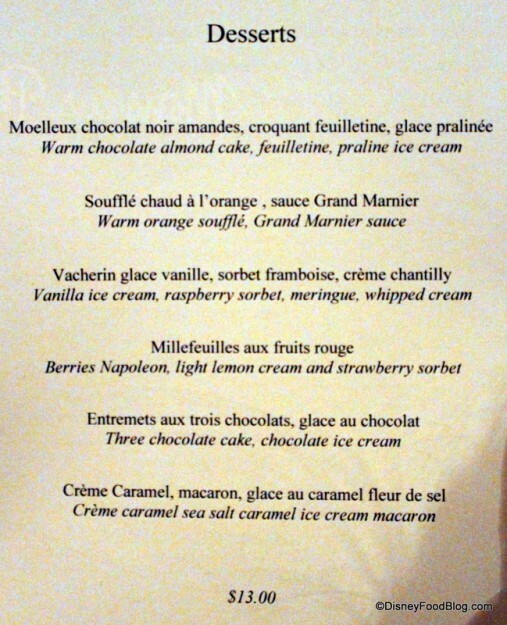 Another multi-component dessert, this one arrived with Custard, a Chocolate Macaron, and Fleur de Sel Caramel Ice Cream. This was a beautiful dessert. While I’m not normally a huge fan of eggy custard, I loved that there were other desserts on the plate that I could enjoy. 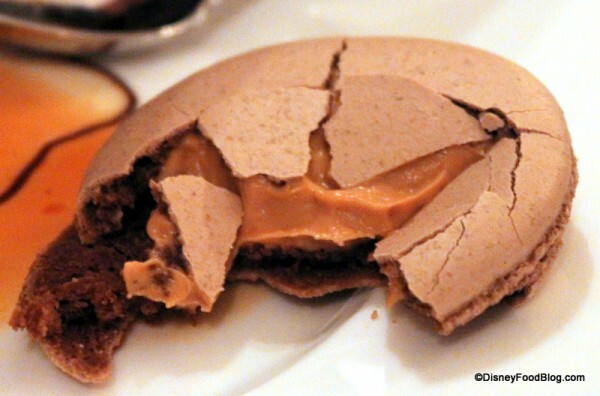 I especially loved the macaron with its rich caramel center. The rich ice cream was delightful, too. There is also a nice selection of Dessert Wines and Digestifs, or after dinner Cognacs and liqueurs. Next time, perhaps! The Remy Martin Louis XIII bottle was such a piece of artwork itself that I snapped this photo for you. And that brought us to the end of another fine meal in Epcot’s France. A dinner at Bistro de Paris has always been a special evening, and Monsieur Paul continues that tradition. 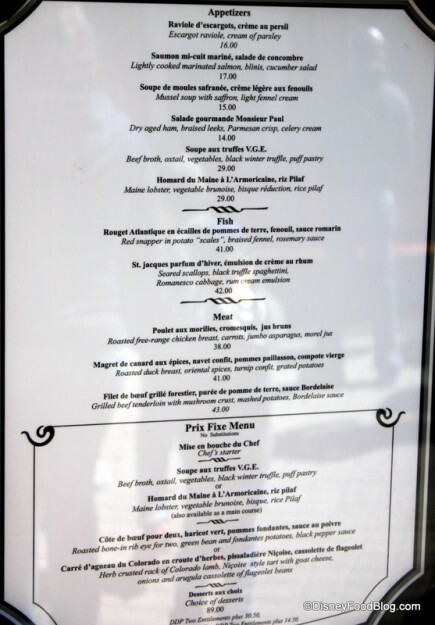 The menu is VERY similar to the old Bistro menu, so if you loved Bistro, you’ll likely enjoy Monsieur Paul as well. Service, in my opinion, has been a problem for Bistro in the past. Our server was a bit scattered and flighty, but very kind. 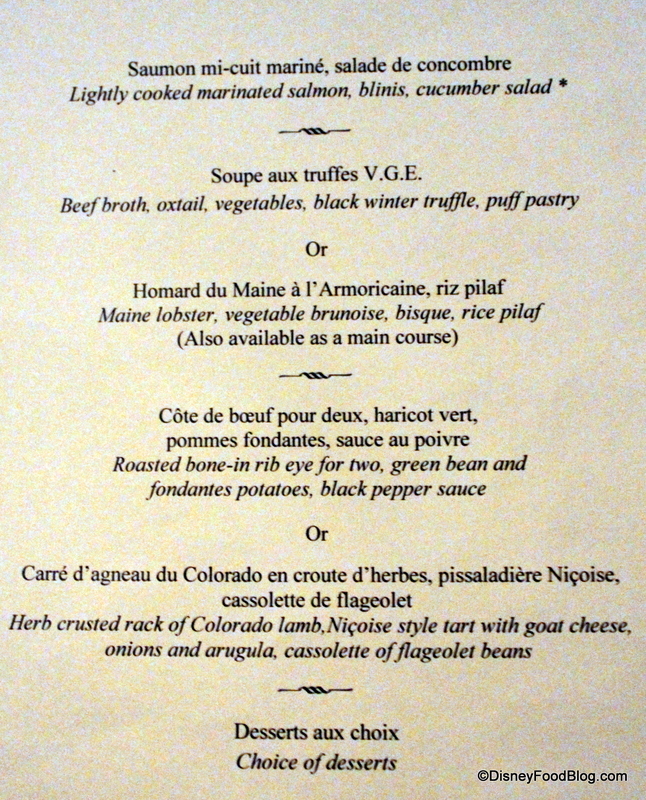 Our server worked hard to explain at length the background of each dish, which enhanced our enjoyment of the offerings. Monsieur Paul also continues to offer incredible views of Illuminations from its second floor vantage point — a fact you should consider as you plan your meal times. The windows remain small, however, so be sure to request a window table if you wish to really see the show. Still, I struggle with whether the food is, for me, worth the cost. While it has a lot of charm, and I don’t mind the changes, I would probably not consider this a “must do” destination every trip simply on the basis of expense. I’d choose Flying Fish, Le Cellier, Jiko, Artist Point, or Yachtsman over Monsieur Paul when it comes to a signature restaurant, most likely. But if you’re looking for a fancy in-park dining experience, and price is not a factor, I would recommend visiting Monsieur Paul. 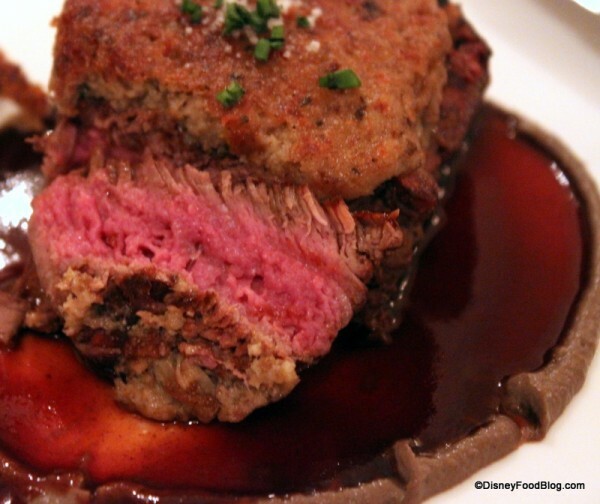 It’s a restaurant that every Disney food lover should experience at least once. Is Monsieur Paul one of your favorite dining destinations? Leave a comment and tell us about your experience here. Many thanks! You’ve saved us both a lot of cash! We had fully intended booking a table for our next visit. 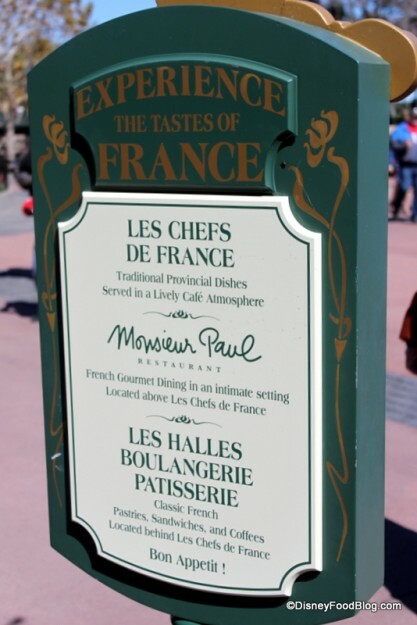 We are both, most definitely food snobs, and my belief that the Bistro de France/Monsieur Paul had always been tipped as Disney’s best Signature restaurant has just been shattered in the nick of time! 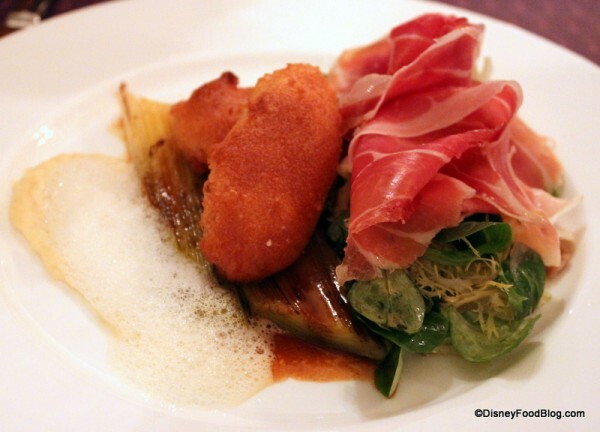 As an outright Disney fan, it truly pains me to write badly about their efforts, it is easy to jump on that bandwagon, but, this of all restaurants in WDW should be faultless! My problem with Disney is that their signature restaurants often give me the impression that the dishes tend to be prepared by simply ‘putting together’ a bunch of ingredients rather swiftly almost as a conveyor belt process. Gourmet dishes should be prepared carefully and almost individually and consistently. Those desserts, (and other dishes shown in the review) truly look as if someone has rushed into Publix, grabbed an armful from the cake counter, all because the pastry chef didn’t show up! 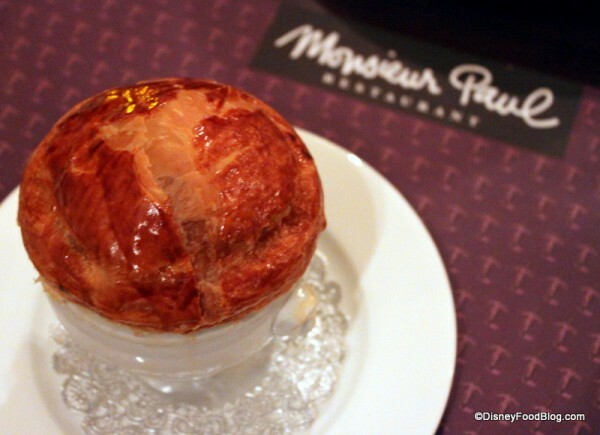 Disney’s food has improved a lot over the recent years, but, looking at Epcot’s Monsieur Paul, they still have a way to go! For the prices the service seemed to be nothing I would expect. I would not be happy receiving someone else’s appetizers or been happy having my appetizer delivered after it was put on someone else’s table long enough to take a picture. Highly doubtful the kitchen refired and if they did the people waiting, waited longer. Also, your meal should be timed to be delivered together. Getting you side 10 minutes after your entree seems wrong. Normally it would be no big deal but when paying high prices for the experience, the experience should be amazing. I really appreciate your honest review. I would hate to waste time and money on vacation and come out disappointed. I have mixed feelings about this. On the one hand, I understand and appreciate what they’re going for, the experience of haute cuisine as found in an expensive, upscale restaurant or hotel in Paris. On the other hand, the best French cuisine is often found in the provinces, often in little family-run restaurants with limited menus based on regional produce and techniques. The chairs do not match; there is often a passionate, if not totally crazy, person cooking in the back; locals sit for hours filling their expanding stomachs with food and wine; cousin Georges is waiting the tables; and the food is to die for. I’ve often wondered if the France pavilion would do better to have this more quirky, rustic dining experience than to have an upscale, urban-style restaurant. Personally, I would prefer it over haute cuisine. 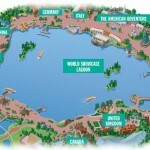 After all, the U.K. pavilion has a pub and a chippy, not Claridge’s. That must have been disappointing to pay all that money for food and to really like only a few things. Thanks for reviewing this so we know what to expect and maybe think twice about going. That’s a fantastic view of Illuminations! I’m glad you had a picture of the beef with the mushroom crust. It definitely looks different than the way that I had pictured it in my head. It looks so much fluffier than a crust.. ah well. Those desserts look pretty amazing, but the rest doesn’t appeal to me. 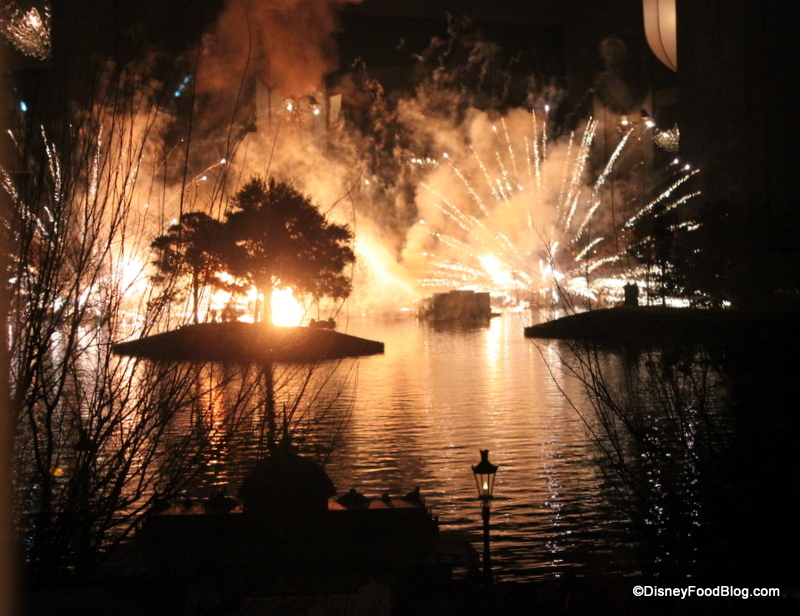 Great pic of Illuminations, though! I would also struggle with the price/quality issue. 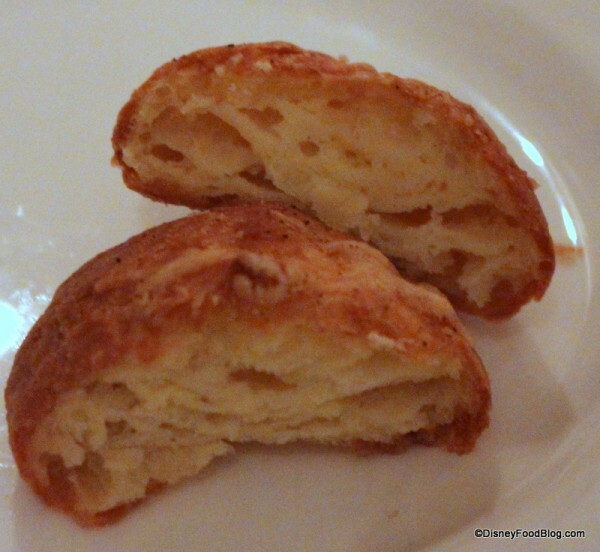 I thought it might help a little if you knew that Gougeres are not biscuits but are made with the same dough that is used in cream puffs and eclairs. When the cheese is added it makes for a light, moist and cheesy mouthful which doesn’t compare to a great cheese biscuit but is wonderful on another level. We’re booked for May 1st and I can’t wait! The red snapper and desserts look awesome. 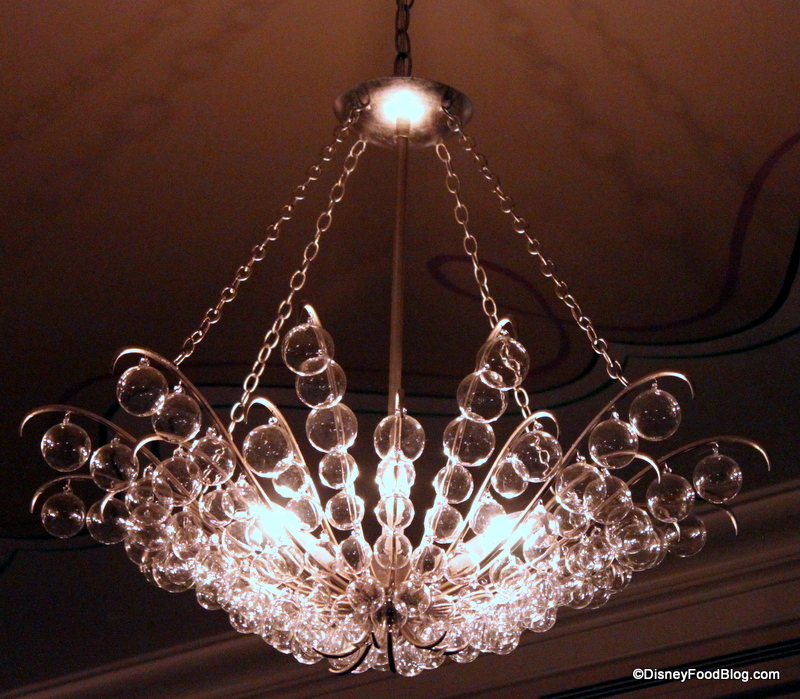 Love the bubble chandelier too. That’s about how we felt about the place. We definitely enjoyed what we had, and it was prepared very well, but I think unless I find a standout dish that becomes a favorite, I’ll probably continue to dine at one of our favorite Signature restaurants instead. One difference I noticed was that our server was a LOT more gregarious than the ones we’ve had on previous visits, and I wonder if they are being trained to be this way as part of the new, more casual feel. Surprised by the changes in decor. For a signature resturant, charging those types of prices, I do not want to feel like I am in a street side cafe. Paper place mats? eh…. Kev — It really wasn’t that bad; but it wouldn’t be my choice for a date night most likely. It’s worth a try, though, if you’re a true culinary guru — it could be that my palate just isn’t developed enough. Tracy — I never thought about it that way or from the perspective of the folks whose appetizers I was photographing! Agreed that I wouldn’t want that food delivered to my table, either. Katie — Perhaps if we’d made different choices. And I believe my dining companion had a better experience than I did due to her menu picks. It’s why I review Disney restaurants multiple times — menus, chefs, service, just about anything can change your experience 180 degrees. Ayn — Ha ha! Thanks for the education — that IS helpful! Erin — So great! I can’t wait to hear what you think! Ask for extra sauce on that snapper..yum! Carrie — Yep. Agreed on the finding a stand out dish. And SO agreed on the gregariousness of the servers!! It wouldn’t surprise me if that’s now in the training, as Bistro was criticized for snobby service in the past. Dan — That’s how I felt at first as well. The paper placemats were a big surprise for me at first glance…and actually was one of my biggest notes of “difference” to take from the experience. paper placemats. geez. what are they DOING?! It used to be very quiet. a place to relax and feel pampered. 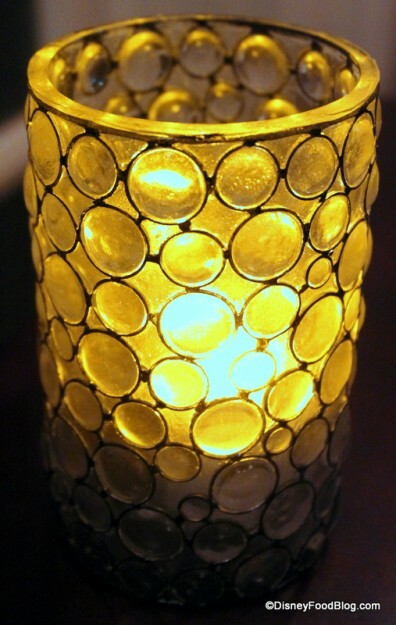 paper placemats and 1960’s bubble lights? gregarious servers? this is not what I want. Wonderful, thorough review. This site is the best resource for Disney Dining that exists. So thanks for all the hard work. It is a shame about those paper place mats though. IMO this just follows the trend of declining standards in the Disney Dining experience. 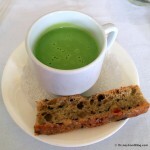 My wife and I went to Monsieur Paul in early March and loved it. We hadn’t been to les bistro in a few years so it was fun to give the new Monsieur Paul a go. If I were to complain about one thing it would be the paper place settings, I admit that put me off at first. The meal and service were excellent. I had the soupe aux truffes too, and while I thought it was good, I agree that the truffles are not featured enough. The magret de canard was possibly the best magret de canard I’ve had (including restaurant 58 tour eiffel on the eiffel tower in paris). My wife had the snapper and it was delicious and as you mentioned, the sauce was something special. I had the soufflé also and thought it was exquisite. Our waiter jean-pierre or JP was excellent. After we sat he offered to relocate our table to window side seating to watch illuminations (all window seats were taken when we arrived). My wife and I don’t mind paying top dollar for an excellent dining experience but I understand it’s not for everyone. All said and done, I can’t wait to go back (please excuse typos, I’m on a mobile device) Thanks for the review I enjoyed reading it. Went their tonight. $300.00 mistake. Had the worst meal and the manager wa so rude. Lucky I was feeling the Disney magic. Her steak was so undercooked it was cold and raw in the middle. Made her stomach turn. While the waiter was cordial, the manager got my temper flaring, and while I was polite, I told him I would tell every one of my friends and family and anyone I could to avoid this terribly overrated and expensive place. It appears they’ve done away with the traditional table side crepe trio? That was one of the main draws for me. I see they kept the filet (which looks exactly the same) and the duck but I’m not crazy about the rest of the menu. I’m also disappointed with the refurbishment. The decor looks cheap and not french at all. If I’m going to spend almost $200 on a meal, I want to feel like I’m eating at a quality restaurant. The leather bound menus have disappeared and they are putting paper place mats on the table? This is a major downgrade in my opinion and I’m seriously disappointed. Thanks for the review. Now we know better than to waist one of our evenings eating here. 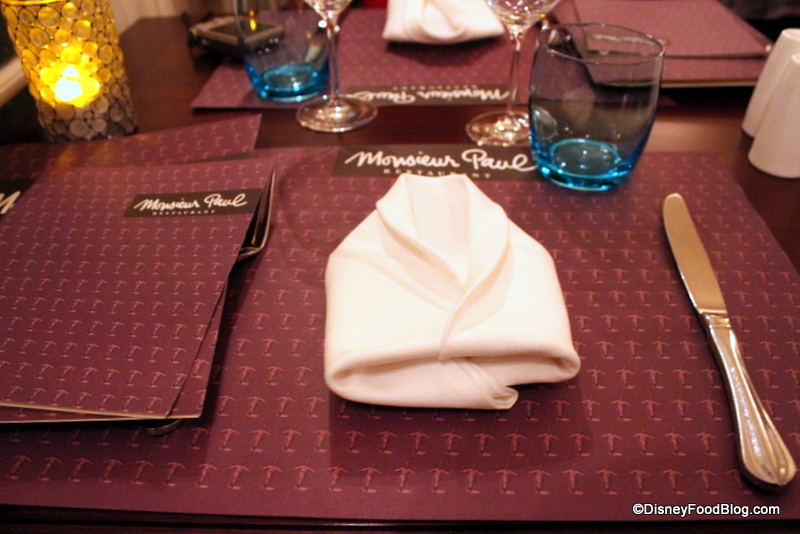 We loved our experience at Monsieur Paul! The Disney Dinning Plan helped. My husband and I ate there April 24 for our Anniversary. The decor is simple yet elegant. Alex was our server and he was attentive without hovering. Alex made a perfect wine recommendation that complemented our dinner. Our Filet de Boeuf Grillé Forestier were cooked to perfection and the almond cake was a delightful ending to our meal. All in all a Disney perfect experience. Thank you to the Monsieur Paul staff for making our 2nd Anniversary wonderful. I suppose I have been living under a rock, or perhaps just busy with a newborn, but I was so sad to just learn that Bistro de Paris is no more!!! My husband and I had our wedding reception there in 2006 and everything was phenomenal. We had a fantastic relationship with the restaurant’s manager, Phillipe, and would pop in whenever there on vacation. Though, admittedly we haven’t dined there in the past couple years. 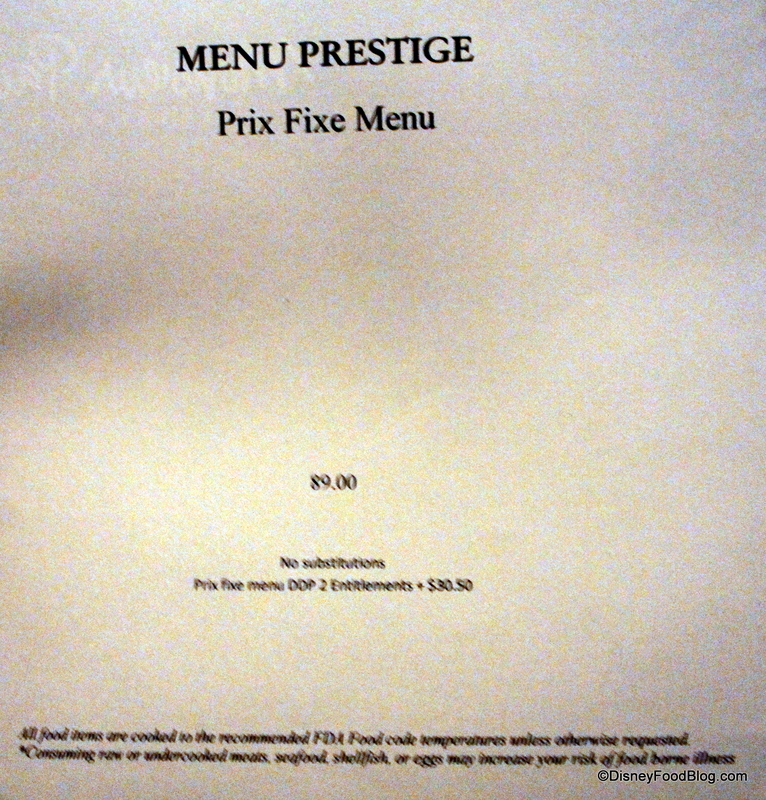 I am sad to hear that the new restaurant, while pricey, doesn’t seem to provide the best experience. I might have to give it a try on our next visit for old times sake and to experience the changes for myself. You were right on with the Soupe aux Truffles. I know truffles and I’ll be damned if there are any in the soup. 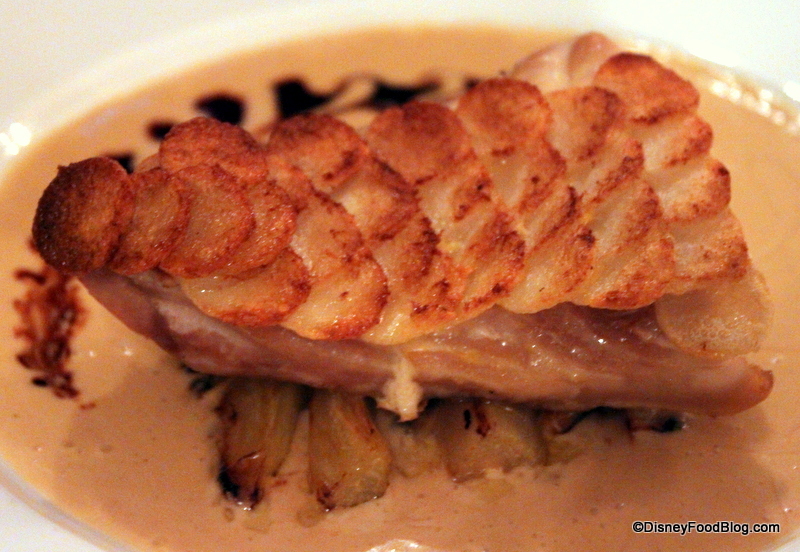 Overall, the food is pretty good, but the service was a joke – far below the standards of Paul Bocuse. The restaurant is actually operated by his son. Possibly the worst thing is that there was no enforcement of the dress code. If you are looking for a special evening out, avoid this place. Also avoid it in all other situations. Disappointing!!! This past weekend we had a family anniversary dinner at Disney’s Monsieur Paul. The food was good…but, expensive…over $900 for 8 people. Our reservation was made online with a cake order specifically for a chocolate cake with chocolate icing and “Happy Anniversary” written on top. The disappointment came when the server brought out the wrong cake….white cake with white icing…it looked like a Birthday cake with the word Birthday scrapped off and Anniversary scrawled on the top. The server, at first, wanted to argue with me that it was the cake I ordered…but, she later apologized. By the way, I did save all my reservation requests which were written in detail…”Chocolate Celebration cake with Chocolate icing….with ‘Happy Anniversary’ written on top”…. (perhaps I should have written it out in French…). The Monsieur Paul manager blamed it on the company (apparently separate from their restaurant) that makes the cakes…Chefs de France. And, the Monsieur Paul manager tried to make amends by serving a tablespoon of chocolate ice cream on the side for each of us (the spoon was larger than the serving of ice cream…about ½ a bite…). And, he did finally take the charge for the cake off of the bill. But, we were still very disappointed that we got the wrong cake and had to put in a complaint about it. We are Floridians that live near Orlando….and visit Disney often. But, we will not revisit the Monsieur Paul restaurant again. My wife and I will be celebrating our 40th wedding anniversary at Monsiuer Paul on May 7th. We booked a time to take advantage of illuminations. How do we guarantee a window seat? 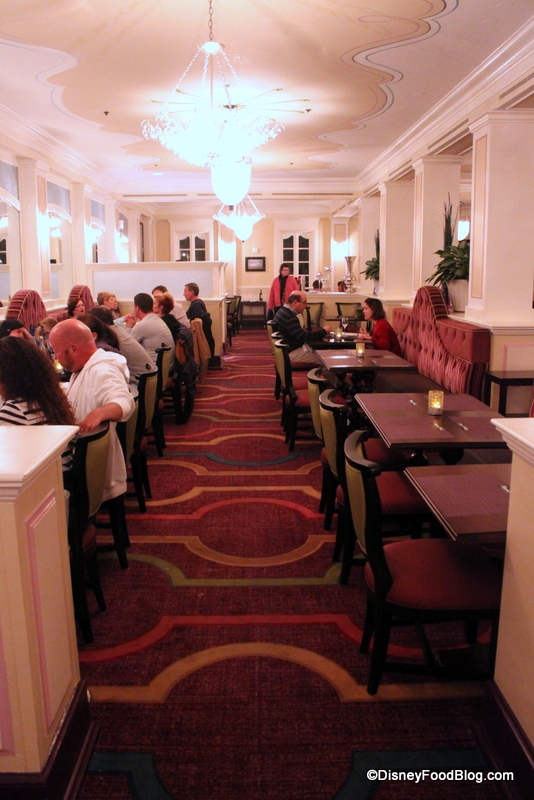 Also thinking of stopping for a post Illuminations nightcap in the Boardwalk area. Any comments on the boat or a lounge suggestion in that area. Hi Lew: You can’t guarantee a window seat, but if you arrive for your reservation 30 minutes in advance and request one, they’ll likely be able to oblige. I can highly recommend the boat to see IllumiNations; I’ve done this several times and have always been impressed. 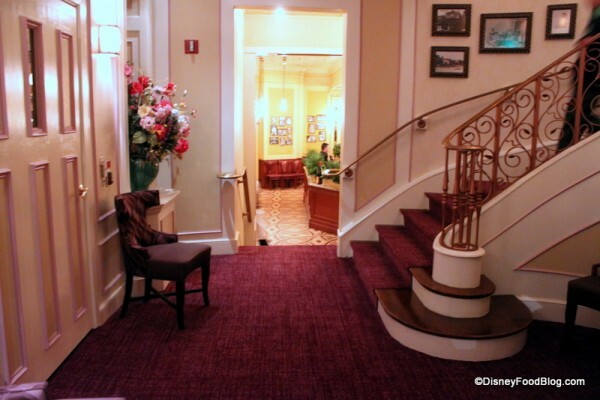 As for a lounge for a nightcap — your choices include Crew’s Cup Lounge at the Yacht Club, Martha’s Vineyard at the Beach Club, ESPN Club bar, Jellyrolls Dueling Piano Bar (there’s a cover charge for this, but it’s great fun), Belle Vue Lounge at the BoardWalk, Kimono’s Sushi Bar at the Swan (offers karaoke), bluezoo Lounge at the Dolphin, Il Mulino lounge at the Swan, the bar at Big River Grill (house made beers)…so many options! 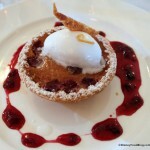 We ate at Monsieur Paul this past Saturday and it was a great meal. This restaurant was on my bucket list since I had eaten at several fine restaurants in France, including a Michelin one star that took five hours! While Monsieur Paul isn’t a Michelin one star, it was definitely comparable to the finer French restaurants I have experienced. Also, we booked about two weeks out and the only time was 5:30. Turns out this was the best time as we were in the first seating and got a table for two by the window for a wonderful view. The table had white table cloths, not paper placemats that others had mentioned. This restaurant was also very quiet and peaceful, not like the downstairs one. I got the escargot ravioli, and while it was very good, I didn’t care for the flavor of the sauce. My wife got the salad and she liked it. I also got the mussel soup which was exquisite. We both had the red snapper and it was cooked perfectly with an outstanding sauce. Fine sauces are what really makes a god French meal. A couple next to us had the filet and duck. They said both were very good. Oh, and the bread was a sampling of breads, including tasty mini-baguettes. We would definitely do this again. FYI, the fancy cognac bottle you took a picture of is NOT the Remy Martin VSOP. 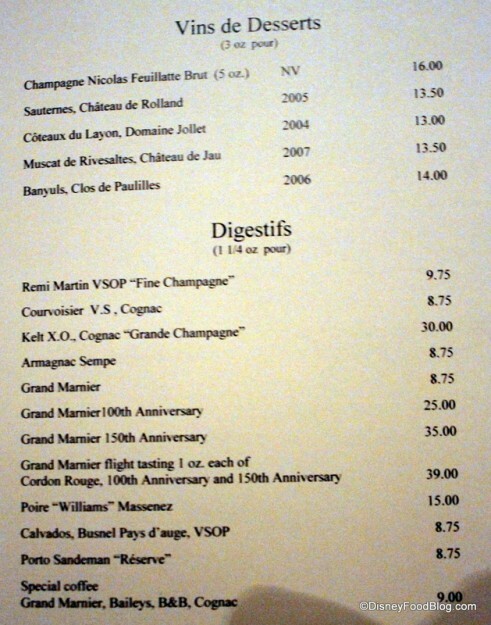 Cognac generally comes in 3 grades, VS is the cheapest (around $30 per bottle), VSOP is the mid-range (around $50), and XO is the premium stuff (around $175). 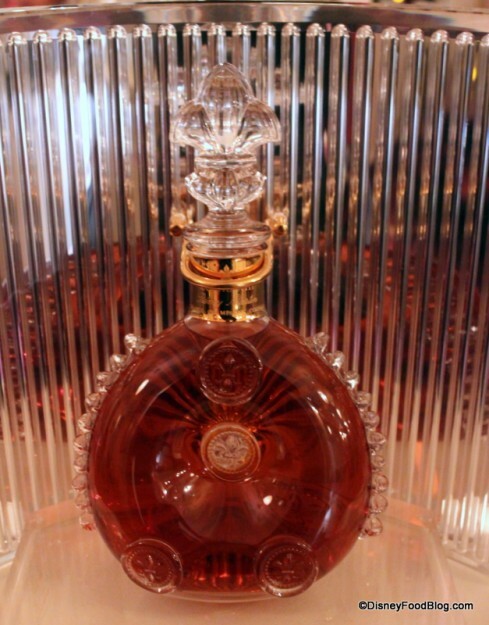 The bottle in your pic is Remy Martin Louis XIII, which is their super-insane-premium stuff that costs upwards of $3000 per bottle. Actually just the used empty bottle (which is Baccarat crystal) will fetch $150 on eBay. Considering it’s not listed on the menu, and the bottle looks pretty full, I’m assuming it’s just there for looks. But still, very cool! Christopher — Thanks so much for the clarification! I’ve updated the post and caption to reflect the information that you shared. You learn something new everyday. 🙂 We knew it was special, but that’s incredible! FYI, the Disney Dream/Fantasy has an even CRAZIER bottle of Remy Martin Louis XIII called Rare Cask that costs about $30,000 a bottle. (No, that’s not a typo.) It actually gets delivered to the ship under armed guard. And a 1pz glass costs $1300. I’ve heard reports that there’s a big ceremony if you order this, and you also get a special Baccarat crystal glass to keep, and a pair of cufflinks if you’re a man or a diamond pendant necklace if you’re a woman. 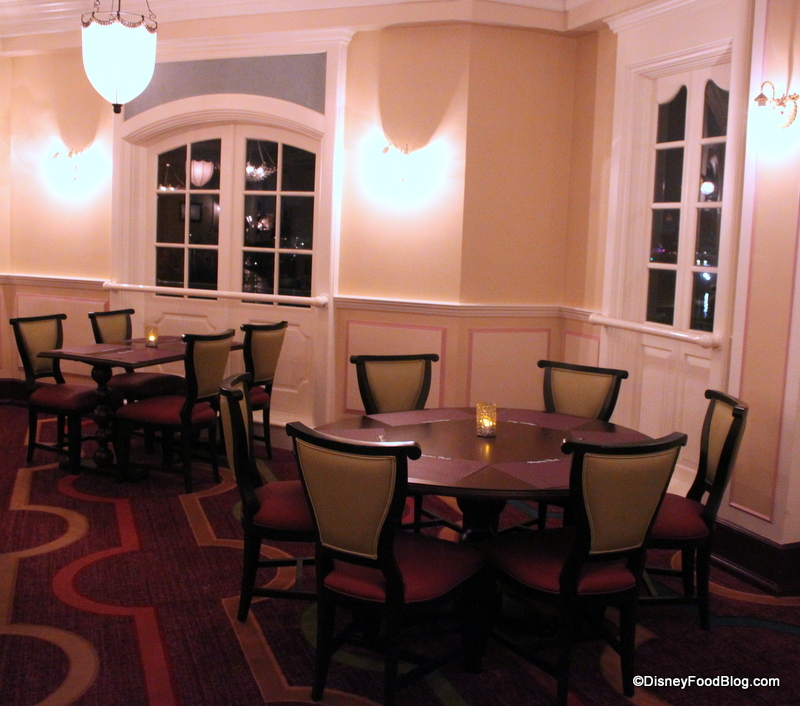 We dine there last September for Epcot Wine & Food Festival. It was amazing everything was great. Their pairing of the wine & food was perfect as well as learning about the wine and why it was paired with various food. Everything was so good we made dinner reservation the following evening. We are looking forward to dining there again this year. It brought us back to dining in Paris! My wife and I ate at Monsieur Paul just two days ago, and while the menu has changed a bit, our review echoes those you mentioned well over a year ago. While the food was largely savory and presented nicely, the soul of fine dining was missing. There were no amazing dishes, just solidly constructed ones. Not one item made me sit up and take notice or want to return. 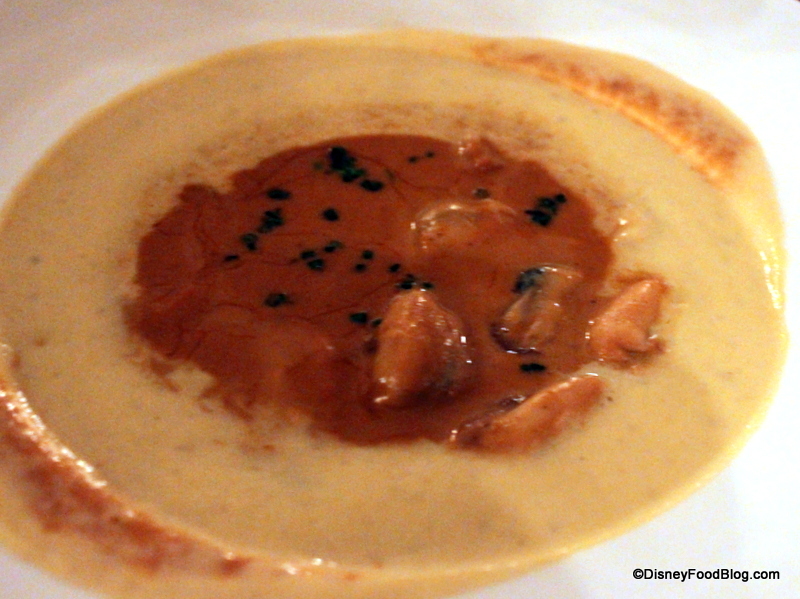 The closest we came to a “wow” dish was the carrot soup with goat cheese ravioli–delectable and full of piquancy. Beyond that, however, my escargot with a bacon foam was tasty but the snail was overcooked. The scallops were tiny and accompanied by a lettuce-corn-cream puree that lacked depth, and my duck was cooked properly (medium rare) but the skin was rubbery. The apple tart was unimaginative and dully flavored, as well. Overall, I’d wrap up our experience with one word: uninspired. While the view of Illuminations was nice and service excellent, we have no plans to add this to our rotation of signature restaurants. Wish I read this before we went here for our anniversary last week. Service was only ok. We had to wait for bread, wine and coffee before we could enjoy each course. The food and presentation were okay. We’ve eaten tastier meals downstairs for half the price. 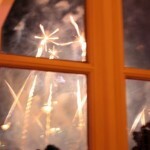 The Illuminations fireworks were a pleasant surprise. We had a window seat. But when the check came it made it difficult to justify eating here. Hands down the most expensive meal we’ve ever eaten. Next time will stick with the California Grill. 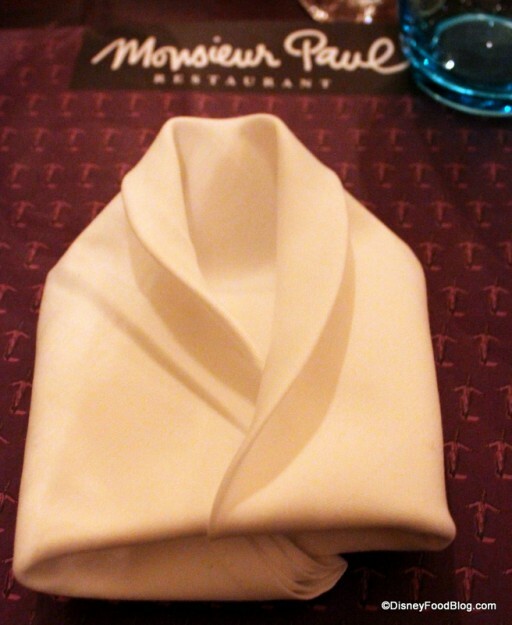 My mom and stepfather went to Monsieur Paul on December 30, 2014 for their anniversary. They were really looking forward to this as for about a decade this had been the tradition on their anniversary. I helped by making their reservation. At that time I was asked if they were celebrating anything. I said yes and explained. Now fast forward to the anniversary dinner. It was so very sad. If you look at the photos you’ll notice 2 rows of tables. Well on that night they had placed a third row in the middle of the aisle. As I imagine you can see it was uncomfortably close quarters. The food was nothing to remember and no mention was made of their anniversary. How sad! I know that this might have been an addition to accommodate more over the holidays but it was a poor choice. 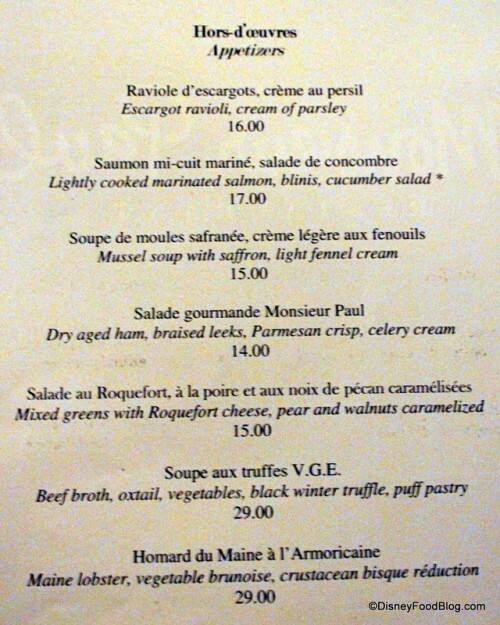 The meals are expensive and folks reserve at Monsieur Paul partly for the experience. This was ruined for my parents. My mother said it was “closure” for them. Had they not returned and found this un-enjoyable experience they might have always wondered. At some point Disney has to draw the line on crow level. This was a poor choice to put more tables for more guests. Teri, sorry to hear of the anniversary experience for your mother and stepfather. Your comment encapsulates the trouble with dining at MP given the cost. The food is no longer consistently memorable; the service is spotty; and given the lack of a dress code and the crowding issue, no one should waste $100+ per person to be disappointed. As an epilogue to our unsatisfactory visit back in September, I wrote to the Disney customer service office detailing our poor experience. Surprisingly, that office contacted us and worked to refund our money. Disney alone can’t refund the money as the restaurant is run by a corporation that gets the final word. However, I can say that a little more than two months after filing our complaint, we were refunded our entire bill. We still won’t be going back, though. I have eaten at Monsieur Paul many time from when it was the bistro and now as Pauls. I have always enjoyed the service as top notch and the food is always wonderful. I just made reservations to be there again this month. It is always a highlight of our Disney trip. My wife and I are food snobs as many above have mentioned. Perhaps many have been walking around the parks all day with screaming kids and don’t take the time to sit for a couple of hours and relax with a great bottle of wine, delicious food and good friends! My husband and I had a wonderful meal. Service was wonderful! Food absolutely awesome. 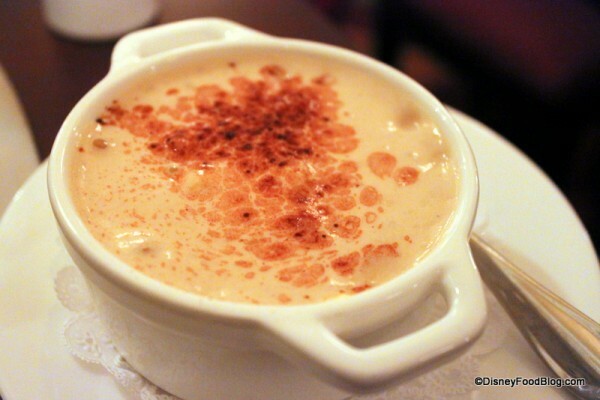 Love the onion soup. This was the worst meal I have ever eaten. Don’t waste your money on the way over priced frozen food. 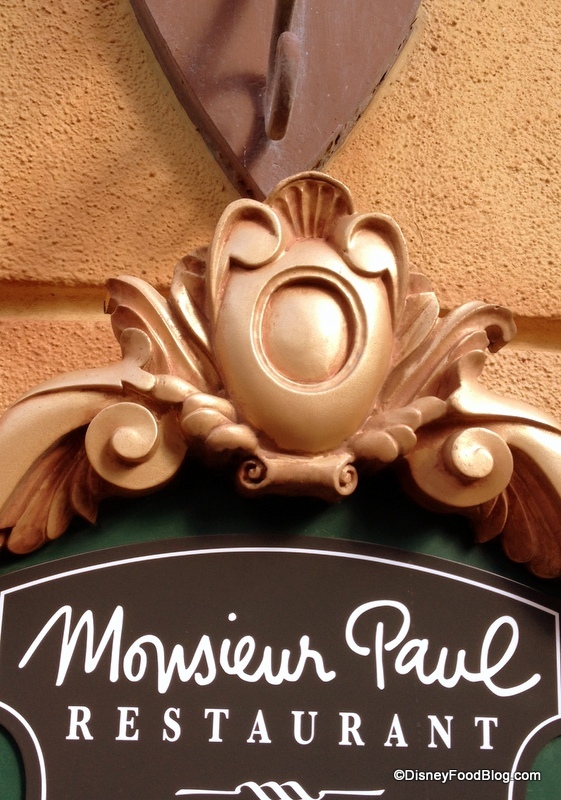 Monsieur Paul is the worst food I have ever eaten, and the food is way overpriced for frozen food . At those prices the food should be fresh not frozen. I would not waste my money.